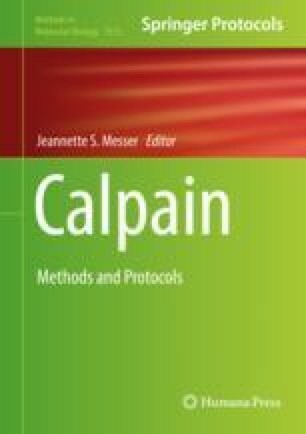 Calpains are a family of calcium-dependent intracellular cysteine proteases that regulate important physiological processes by substrate cleavage. Despite the fact that Calpains have been identified in the Xenopus genome, their expression patterns and role have not been characterized. Therefore, herein, we describe two methods to determine temporal and spatial expression of Calpain 2 during Xenopus development, namely, RT-PCR and whole-mount in situ hybridization (WISH). In addition, indirect immunofluorescence (IF) is described to determine translocation to the plasma membrane, which correlates with activity levels of Calpain 2. Anna Charalambous and Ioanna Antoniades contributed equally to this work.